Last time, we talked about the first 2 of 4 quant strategies that everyone must master: Test Cases and Choose Smart Numbers. For copyright reasons, I can’t reproduce the entire problem, but here’s a summary: John spends 1/2 his money on fruits and vegetables, 1/3 on meat, and 1/10 on treats from the bakery. He also spends $6 on candy. By the time he’s done, he’s spent all his money. The problem asks how much money he started out with in the first place. Work Backwards literally means to start with the answers and do all of the math in the reverse order described in the problem. You’re essentially plugging the answers into the problem to see which one works. This strategy is very closely tied to the first two we discussed last time—except, in this instance, you’re not picking your own numbers. Instead, you’re using the numbers given in the answers. 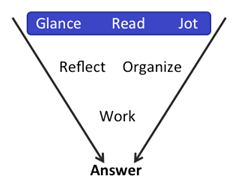 In general, when using this technique, start with answer (B) or (D), your choice. If one looks like an easier number, start there. If (C) looks a lot easier than (B) or (D), start with (C) instead. Set up a table to calculate each piece. If John starts with $80, then he spends $40 on fruits and vegetables. He spends… wait a second! $80 doesn’t go into 1/3 in a way that would give a dollar-and-cents amount. It would be $26.66666 repeating forever. This can’t be the right answer! Interesting. Cross off answer (B), and glance at the other answers. They’re all divisible by 3, so we can’t cross off any others for this same reason. In order for (D) to be the correct answer, the individual calculations would have to add back up to $120, but they don’t. They add up to $118. Okay, so (D) isn’t the correct answer either. Now what? Think about what you know so far. Answer (D) didn’t work, but the calculations also fell short—$118 wasn’t large enough to reach the starting point. As a result, try a smaller starting point next. It’s a match! The correct answer is (C). Now, why would you want to do the problem this way, instead of the “straightforward,” normal math way? The textbook math solution on this one involves finding common denominators for three fractions—somewhat annoying but not horribly so. If you dislike manipulating fractions, or know that you’re more likely to make mistakes with that kind of math, then you may prefer to work backwards. Note, though, that the above problem is a lower-numbered problem. On harder problems, this Work Backwards technique can become far easier than the textbook math. Try PS #203 in OG13. I would far rather Work Backwards on this problem than do the textbook math! So, have you figured out how to tell, at a glance, that a problem might qualify for this strategy? It has to do with the form of the answer choices. First, they need to be numeric. Second, the numbers should be what we consider “easy” numbers. These could be integers similar to the ones we saw in the above two problems. They could also be smaller “easy” fractions, such as 1/2, 1/3, 3/2, and so on. Further, the question should ask about a single variable or unknown. If it asks for x, or for the amount of money that John had to start, then Work Backwards may be a great solution technique. If, on the other hand, the problem asks for x – y, or some other combination of unknowns, then the technique may not work as well. (Drumroll, please) We’re now up to our fourth, and final, Quant Strategy that Everyone Must Master. Any guesses as to what it is? Try this GMATPrep© problem. “In the figure above, the radius of the circle with center O is 1 and BC = 1. What is the area of triangular region ABC? If the radius is 1, then the bottom line (the hypotenuse) of the triangle is 2. If you drop a line from point B to that bottom line, or base, you’ll have a height and can calculate the area of the triangle, since A = (1/2)bh. You don’t know what that height is, yet, but you do know that it’s smaller than the length of BC. 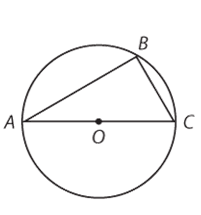 If BC were the height of the triangle, then the area would be A = (1/2)(2)(1) = 1. Because the height is smaller than BC, the area has to be smaller than 1. Eliminate answers (C), (D), and (E). The technique we just used to narrow down the answers is one I’m sure you’ve used before: Estimation. Everybody already knows to estimate when the problem asks you for an approximate answer. When else can (and should) you estimate? Glance at the answers. Notice anything? They can be divided into 3 “categories” of numbers: less than 1, 1, and greater than 1. Whenever you have a division like this (greater or less than 1, positive or negative, really big vs. really small), then you can estimate to get rid of some answers. In many cases, you can get rid of 3 and sometimes even all 4 wrong answers. Given the annoyingly complicated math that sometimes needs to take place in order to get to the final answer, your best decision just might be to narrow down to 2 answers quickly and then guess. Want to know how to get to the actual answer for this problem, which is (B)? Take a look at the full solution here. Here’s a summary of our four strategies. – Especially useful on Data Sufficiency with variables / unknowns. Pick numbers that fit the constraints given and test the statement. That will give you a particular answer, either a value (on Value DS) or a yes or no (on Yes/No DS). Then test another case, choosing numbers that differ from the first set in a mathematically appropriate way (e.g., positive vs. negative, odd vs. even, integer vs. fraction). If you get an “always” answer (you keep getting the same value or you get always yes or always no), then the statement is sufficient. If you find a different answer (a different value, or a yes plus a no), then that statement is not sufficient. – Also useful on “theory” Problem Solving questions, particularly ones that ask what must be true or could be true. Test the answers using your own real numbers and cross off any answers that don’t work with the given constraints. Keep testing, using different sets of numbers, till you have only one answer left (or you think you’ve spent too much time). – Used on Problem Solving questions that don’t require you to find something that must or could be true. In this case, you need to select just one set of numbers to work through the math in the problem, then pick the one answer that works. – Look for variable expressions (no equals or inequalities signs) in the answer choices. Will also work with fraction or percent answers. – Used on Problem Solving questions with numerical answers. Most useful when the answers are “easy”—small integers, easy fractions, and so on—and the problem asks for a single variable. Instead of selecting your own numbers to try in the problem, use the given answer choices. – Start with answer (B) or (D). If a choice doesn’t work, cross it off but examine the math to see whether you should try a larger or smaller choice next. – You’re likely already doing this whenever the problem actually asks you to find an approximate answer, but look for more opportunities to save yourself time and mental energy. When the answers are numerical and either very far apart or split across a “divide” (e.g., greater or less than 0, greater or less than 1), you can often estimate to get rid of 2 or 3 answers, sometimes even all 4 wrong answers. The biggest takeaway here is very simple: these strategies are just as valid as any textbook math strategies you know, and they also require just as much practice as those textbook strategies. Make these techniques a part of your practice: master how and when to use them, and you will be well on your way to mastering the Quant portion of the GMAT! 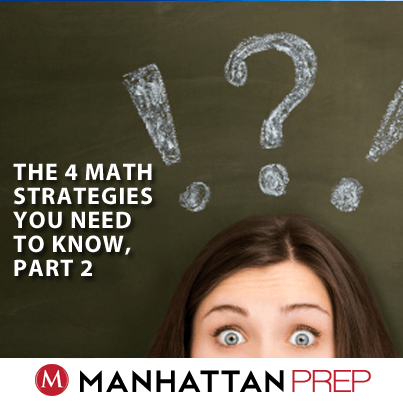 Read The 4 Math Strategies Everyone Must Master, Part 1. We need to know a lot of different facts, rules, formulas, and techniques for the Quant portion of the test, but there are 4 math strategies that can be used over and over again, across any type of math—algebra, geometry, word problems, and so on. Try this GMATPrep® problem and then we’ll talk about the first of the 4 math strategies. *If mv < pv < 0, is v > 0? A pharmacy must purchase a set of n metal weights, each weighing an integer number of grams, such that all integer weights from 1 to 300 grams (inclusive) can be made with a combination of one or more of the weights. What is the minimum number of metal weights that the pharmacy must purchase? What do you do when you realize a geometry problem has just popped up on the screen? Try this GMATPrep© problem from the free practice test and then we’ll talk about what to do! In the figure above, the radius of the circle with center O is 1 and BC = 1. What is the area of triangular region ABC? What’s your first step? Let’s use this problem as an opportunity to practice the Quant Process. At a glance, you can see that the problem provides a diagram. Draw! Make it big enough that you can add labels as you calculate new pieces of information (and, of course, jot down any information given in the problem). 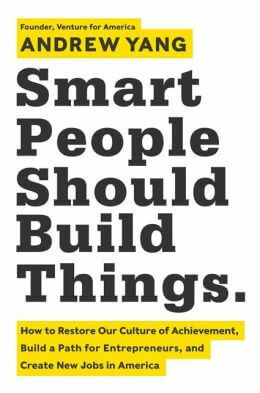 Below is an excerpt from Andrew Yang‘s new book, Smart People Should Build Things: How to Restore Our Culture of Achievement, Build a Path for Entrepreneurs, and Create New Jobs in America, which comes out in February 2014. Andrew was named Managing Director of Manhattan GMAT in 2006, Chief Executive Officer in 2007, and President in 2010. He left Manhattan GMAT in 2010 to start Venture for America, where he now serves as Founder and CEO. Let’s imagine a very large company. It is a leader in its industry and much admired by its peers. It invests a tremendous amount of money—literally billions of dollars a year—in identifying, screening, and training its many employees. Those employees who are considered to have high potential are sent to special training programs at substantial additional cost. Happily, these top training programs are considered to be among the best in the world. After these employees complete their training, the company encourages them to choose for themselves the division in which they’d like to work. Employee preferences are deemed to be the most efficient way of deciding who works where. This seems like a good system, and it works well for a long time. However, perhaps predictably, many of its most highly rated employees eventually become drawn to the finance and legal divisions because these divisions have very effective recruitment arms, are more visible, pay better, and are thought of as providing a more intellectual level of work. Over time, proportionally fewer of the top recruits go toward the management of the company or the company’s operations. The company’s basic training division is considered a backwater, with low pay and low recognition. And only a relative handful of employees go toward research and development or the launching of any new products. Take a second to think about the company described above. What do you think will happen to this company as time passes? And if you think that it’s not set on a path to success, what would you do to fix it? This company reflects, in essence, the economy of the United States of America. If you are a smart college student and you want to become a lawyer and go to law school, what you must do has been well established. You must go to a good school, get good grades (already accomplished, for many), and take the LSAT (a four-hour skill test). There is no anxiety in divining the requirements, as they are clearly spelled out. Most undergrads, even those with little interest in law school, know what it takes to get in. The path location costs are low. The same is true if you want to become a doctor. Becoming a doctor is hard, right? Sort of. It is arduous and time-consuming, but it is not hard if you have certain academic abilities. You must take a battery of college courses (organic chemistry being the most infamous and rigorous of them) and do well, study for the MCAT (an eight-hour exam), and spend a summer or even a year caddying for a reseNavigator, doctor, or hospital. These are time-consuming hoop-jumping tasks, to be sure, but anyone with a very high level of academic aptitude can complete them. If you attend an Ivy League university or similar national institution, legions of suit-wearing representatives from the big-name investment banks and consulting firms will show up at your campus and conduct first-round interviews to fill their ranks each year, even in a down period (as with the recent years following the financial crisis). They will spend millions of dollars enlisting interns and educating the market annually. Most freshmen have no idea what management consulting is, yet seniors can rattle off the distinctions of different firms with little difficulty. All undergraduates have friends in the classes above them who have gone through this process and gained analyst or associate positions at major investment banks and consulting firms. A set of n identical triangles with angle x° and two sides of length 1 is assembled to make a parallelogram (if n is even) or a trapezoid (if n is odd), as shown. Is the perimeter of the parallelogram or trapezoid less than 10? We’ve invited mbaMission: MBA Admissions Consulting to share their Business School Charts of the Week. Here is their Chart for November 2013 Social Currency Ranking. Rankings come in all shapes and sizes, but can any ranking truly capture social cachet? For a different perspective on the value of an MBA, we turn to the New York Times society pages, where the editors select and profile promising couples. Each month, we dedicate one B-School Chart of the Week to tallying how alumni from top-ranked business schools are advancing their social currency ranking. Colder weather and holiday travel seem to have brought about a lull in the New York Times wedding announcements for November. Still, of the 124 total announcements last month, 19 included a business school mention. Several weddings featured MBA students specifically. For example, Nicholas Tangney, who is a managing director for Lorentzen & Stemoco and is studying for his MBA at New York University’s Stern School of Business, was married to Samantha Lee, a vice president and account manager for consumer products clients at DeVries Global. Similarly,Tracy Massel, a student at Harvard Business School, married Steven Melzer, the director of finance and operations strategy at Expeditionary Learning. Morgan Fauth, a first year at Georgetown’s McDonough School of Business who married research analyst Kevin Patrick Coleman, Jr., was also featured among the wedding announcements. Today wraps up our “Oh What Fun!” celebration! Manhattan Prep’s first-ever 12-day holiday celebration was a great success and we hope that everyone got the chance to enjoy all of our exclusive promos, contests, and free study materials. If you’ve missed any of this year’s celebration, not to worry, we still have a few promotions going on. Our Black Friday Sale for $150 off all December GMAT classes ends December 15, 2013, with code “BLACKFRIDAY150.” There are still some spots open in our two December online classes, which you can sign up for here and here. Located in NYC? Come join us in-person for our classes beginning on Dec. 14th and Dec. 15th. We’re also still offering a free download to our 1-year access GRE Challenge Problem Archive. Remember to enter the code “OWFGRECHALLENGE” at checkout. To keep the giving going and the holiday spirit alive, we are very excited to share today’s final celebration! We will be collecting non-perishable food to be donated to New York’s City Harvest now through Dec. 20th. Our goal is to collect a minimum of 200 food items including but not limited to: canned goods, peanut butter, mac-n-cheese, cereal, soups, pastas, etc. We will also be collecting children’s toys to be donated to the Marine Toys for Tots Foundation. Our goal is to collect a minimum of 50 new/unwrapped toysto be distributed to needy children in NYC. Finally, we are also collecting warm clothing to be donated to New York Cares Coat Drive. Our goal is to collect a minimum of 50 new or gently used coats, sweaters and blankets to be distributed to New Yorkers in need. Donations may be made at 138 West 25th St, 7th Fl. New York, NY 10001. Let’s make this season brighter for our community and those in need. Lastly, be sure to check our Facebook page tomorrow, where we will officially announce this year’s “Oh What Fun!” winners of the free GMAT course and the $250 Amazon Gift Card. A big thank you to everyone in our social community who participated in this year’s “Oh What Fun!” festivities! Enjoy the remainder of the holiday season and best of luck with your studies! Last Friday, I attended the biannual GMAC Summit, a special conference that the makers of the GMAT put on for test prep companies. I want to share various tidbits that you should know! Integrated Reasoning (IR) has existed long enough now that GMAC is starting to be able to draw some conclusions about the efficacy of the section. Dr. Lawrence Rudner, chief psychometrician of GMAC, is quite pleased with the section’s performance to date. There were no admissions officers in attendance, but we did hear from GMAC that they have heard that admissions consultants are starting to consider using IR as a tiebreak for borderline cases. For example, let’s say a school considers 680+ a strong score and 630 to 670 an average score. For the pool of 630 to 670 candidates (only a few of whom are likely to be admitted), one potential tiebreak is the IR score. If IR is not your thing, don’t worry: it’s unlikely that any school is making this tiebreak decision based solely on the IR score. After all, many different variables go into an application; they might also decide to use number of years of work experience, under-represented industries, or some other factor. If you do tend to perform well on IR, though, then bonus: that’s an extra mark in the plus column for you. Interestingly, US students are tending to do a bit better on IR than all other students. (This is also true for the Verbal section of the test, while non-US students tend to do better than US students on the quant section of the test.) A lot of people consider IR more of a quant section, but verbal is just as important. If quant is your strength, then you’ll feel that IR is testing verbal more, and vice versa. I have only one piece of info for you here, but it’s quite an important piece of data. As we were discussing the scoring algorithm, someone asked the age-old question: whether certain questions were “worth more” than others. Dr. Rudner indicated (as he always has in the past) that the earlier questions are not worth more than the later ones. He did, though, indicate something that we suspected but had never heard officially confirmed: “outlier” questions ultimately count less towards your score. What’s an outlier? Briefly, an outlier is a question for which your performance was unexpected. Read on to understand what this means. An outlier is always relative to your own performance. (Note: we’re also talking only about the questions that count towards your score; the experimentals don’t matter here.) Most of the questions you answer will be within a certain range of difficulty. As a general rule, you’ll answer more of the easier questions in your range correctly and you’ll answer more of the harder questions incorrectly. This is the expected behavior.